Dave Jones has made a new video that shunts theory and directly demonstrates the effects of bypass capacitors. It’s worth 30 minutes to get an understanding of this that will serve you well if you’re making custom digital circuits and may wet your appetite for a deeper dive such as with Dave’s other video on the subject or section seven of chapter one of The Art of Electronics. 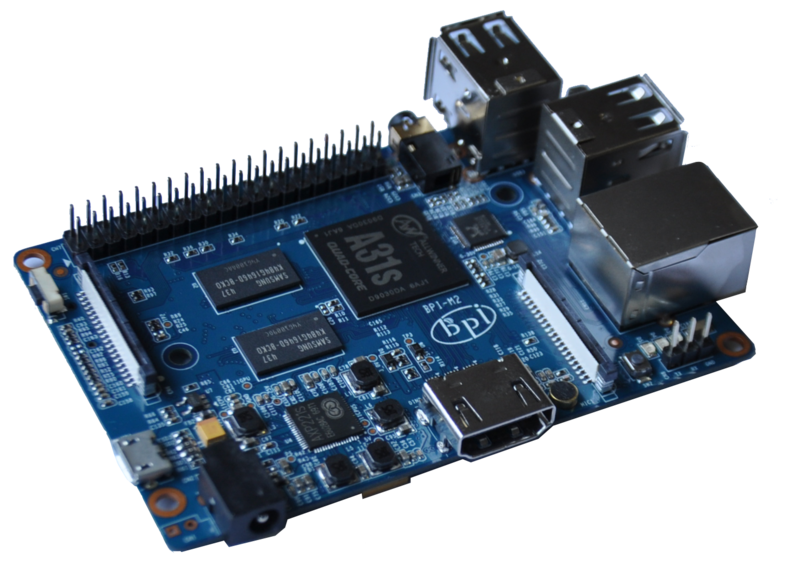 Linux Gizmos has assembled this list of 64 “open-spec, hacker friendly” single board computers. 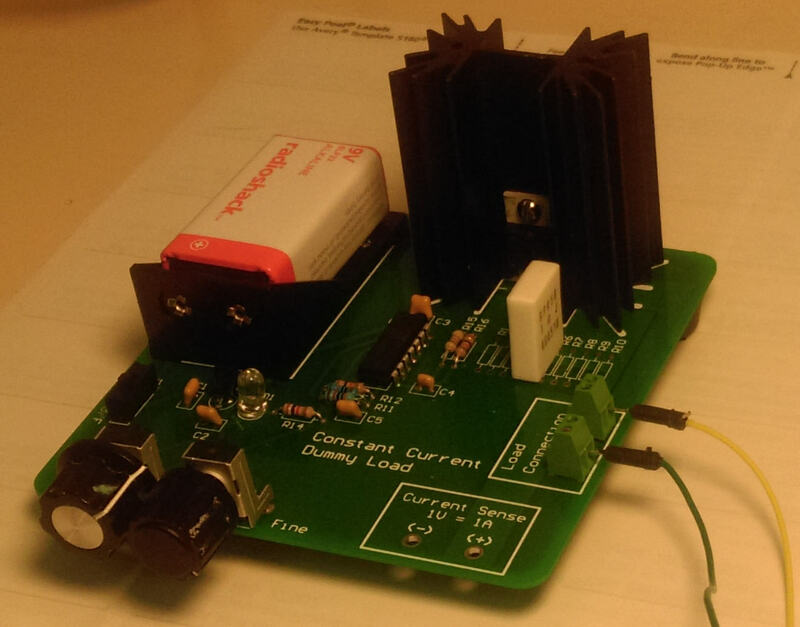 This is a constant current dummy load made from one of Shane Trent’s PCBs like those given away at a recent TriEmbed meeting. 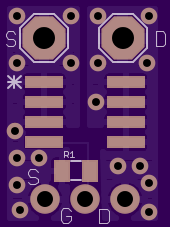 As mentioned on the email list, this PCB is a “fixed” version of a design from a “Sleepy Robot” blog of a guy named Wittenberg, which is itself a derivation of an original design by Dave Jones of EEVblog. Wittenberg had made available gerbers for his design (in early 2012) that were unfortunately defective, and he didn’t allow for two way communication, forcing Shane to go to great lengths to correct the gerbers and get a run of PCBs fabricated. Shane’s blog article covers all this in depth and has a link to the corrected gerber files in zip format. Fast forwarding to the present, here’s a recent tutorial by Dave going into depth about battery measurements. Viewers will just have to put up with the axe-grinding, horse-beating treatment of a “battery life extender” Kickstarter that pushed Dave’s buttons. Apart from this, it’s an excellent treatment and a fantastic “essential subset” spreadsheet tutorial for folks that just want a hint about how to do cool things like the graph-making done in this video. I’ve decided to make it available for borrowing by TriEmbed meeting attendees who can guarantee it’s return by them or their designee at the following month’s meeting. The transistor is not expensive and it won’t be any big disaster (just embarrassing) if it’s accidentally destroyed, but blowing the traces off the PCB will be frowned upon (joke). So this (and perhaps some of the TriEmbed contact cards Paul made, hallway signs, etc) could be part of a shared resource that could expand over time. The “UI” is currently two voltmeter test points, with the unit showing the load current as a one to one mapping from amperes to volts. A digital display with simple USB serial (current and “external voltage” aka battery voltage) logging output and some temperature compensation/auto-calibration is planned, but it would be straight forward to tie the test points to something like an Arduino analog pin or two. Remotely controlling and/or making the current limit programmable would be a bit harder, but a properly coordinated hack to provide an alternative control mechanism would be OK with me and make for a fun project for somebody. The load connection is just four bare plated through holes intended to get some wire loops. These Newark 12H8386 screw terminals solder in and work well. As mentioned, a momentarily loose screw resulted in this Mouser part 660-MF1/4DCT52R10R0F five watt resistor being substituted for the default 10 1/4 watt resistors. The bad news is this resistor has a 350ppm/C coefficient as well as being only 5% tolerance. A better choice than either might be a pair of three watt, two ohm 1% Vishay resistors such as Mouser 71-RS02B2R000FE12. These have 50ppm/C coefficient so there would be about another 1/2% error at the point you could boil water on them. Assuming it has no CAD or fabrication bugs, this board will handle any SOIC8 FET with the pins 1-3 for Source, 4, for gate, and 5-8 for drain. The resistor R1 connects the gate to the source to avoid accidental triggering from high Z or open circuit situations. A value of one megohm should be sufficient. The pads are for an 0805 size resistor. The bottom three pads are for standard or right angle male header pins to go into a standard breadboard. The upper pads are sized for 16 gauge wire to allow high current connections to the source and drain. 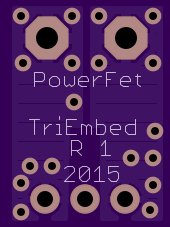 Some assembled and bare boards will be brought to the July 13 TriEmbed meeting at NCSU. If the first version is defective we’ll use them to play tiddlywinks. As soon as the board is shown to have no defects the design will be published to the OSH Park “Shared Project” area on their web site. Ford, Chrysler, RAM, Dodge, and Scion have embraced an open standard for conveniently recharging portable devices that appears to be more effective and just easy to use as inductive charging systems. It’s called Open Dots. The basic idea is to use a set of four parallel conductive strips to carry positive and negative voltages (or +V and ground, depending on your point of view) and have the package of a device to be charged connect to the charging strip automagically just by resting on it. The device to charge has a pattern of four conductive “dots” on its case that will properly connect with the charging pad in any orientation. This scheme was invented for recharging toys in 1963. I’m sharing this as a potentially handy way to deal with the general problem of recharging battery-operated gadgets. It would take a fair amount of work to implement the pieces and parts involved with the actual electrical connections, but based on the specification this is on the other end of the scale from rocket science and one would hope that the basic components may be or become cheaply available if the auto industry is involved . Texas Instruments has introduced a new family of microprocessors called the MSP432. As far as I can tell they’ve combined the very sophisticated power saving modes and mature peripheral functional blocks of the MSP430 family with an ARM M4F core. I’m writing this because the initial chips are available in a QFP package. The initial chips come with a couple of generous flash memory/RAM sizes combinations and run at 48mhz. 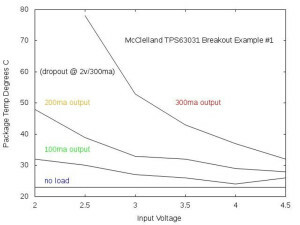 Claimed integer MIPS/MHz are substantially higher than with the MSP430 and current consumption from the datasheet is only 90uA/MHz. But these are probably marketing MIPS and most assuredly marketing microamperes, as they understandably assume little or no peripheral subsystem activity. (Take it from me, you can get any result you want from the Dhrystone benchmark with a good compiler). Still, to the extent that the MSP430’s programmatic support for low power modes is present in spades with a new “power manager” function, and the fact that the chips come with ROM-code peripheral libraries to make porting from the 430 easier, this seems to be an interesting development. I view this as a smart, if not surprising move by TI. At a recent meeting Scott Hall told us about a $4 Cypress ARM system that his work group intends to use with a port of an ultra-lightweight Linux called uClinux. Coincidentally there was a recent blurb on Slashdot about uClinux on a Motorola 68k and here is the article, the related Youtube page, and one of the subsequent (in my opinion, classic) /. comments about this subject. The Slashdot article is here. Here is a fast way to make IC part numbers easy to read (follow this link, then click on “Dicas práticas em eletrônica“). Thank you Luciano Sturaro!! Of the few dozens of different chips I’ve tried this chalk trick on in the past few days I’ve found that maybe 15% are nearly immune to it. 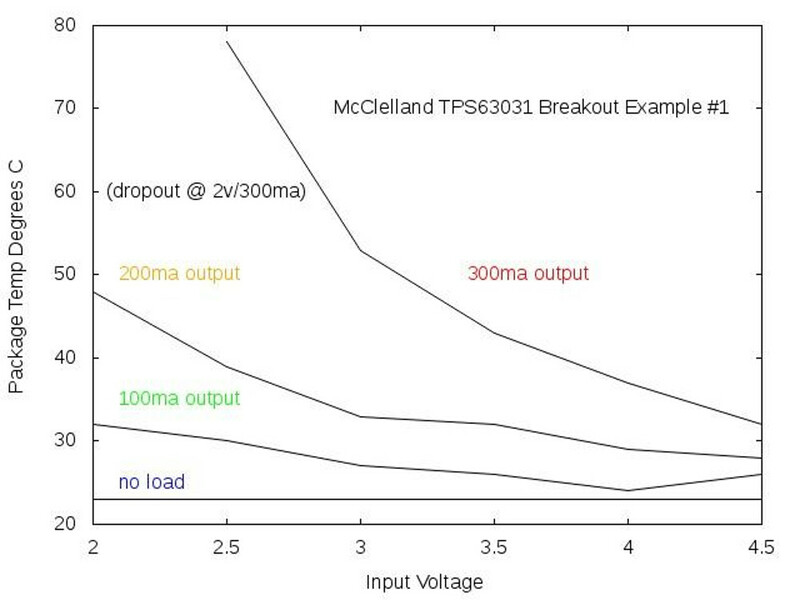 Here’s the graph that got scrubbed out of the list msg about tests of the TI TPS63031 buck/boost DC converter chip (3.3v out for 2-5.5 volts in). When I look at that msg as I got it from the list the graph is there! But I just looked in the archives and see that it was scrubbed. Oh well. This shows the package temperature measured with a cheapo IR themometer with different input voltages and output load currents. Chip McClelland is going to combine this with his tests for more details later.